Back in the middle of June we had Bastian Wölfle come on Chit Chat Across the Pond to talk about how he got fit and healthy. Then a few weeks ago Bart came on Chit Chat to talk about how he used technology, specifically the Apple Watch and My Fitness Pal to finally take off the weight the doctor ordered. I like My Fitness Pal because if I don’t have enough calories, I can walk around the block and it gives me more. I love that statement because it’s exactly the magic of My Fitness Pal. In the app you enter your caloric intake in a really easy to use interface, and if you allow it access to your health data from your phone or Apple Watch or other fitness device, it can track your calories. You tell it how much weight you want to lose (or maintain) and it simply says here’s your budget, here’s what you ate, here’s what you spent in exercise, and here’s how much you have left. Of course Steven always knew that walking around the block would burn calories, but the simple way that My Fitness Pal explains it makes it obvious that you need to go take that walk if you want that cookie. It’s amazing how much “exercise” I get just by choosing how to get from A to B. I’m now climbing the 10 flights of stairs in the office about 5 times a week. I enter the foyer and I hear your and Bastian’s voices in my head. I missed my usual walk this lunch time due to some errands but I’m already at 3/4 of my activity goal instead of the usual 2/3 at this time. I’ve climbed the stairs twice today. Sometimes we just need to be reminded that we could take the stairs. I remember years ago I used to take the elevator down 5 flights of stairs, walk over to the parking structure, take the elevator up 5 flights of stairs, drive over to the gym … only to go on the stairmaster! Once I heard that voice in my head point out the irony, I started taking the stairs. Thanks Allister, great comment! Pat Dengler has been wanting to lose weight for a long time. Since these discussions, she got going with My Fitness Pal and using her Apple Watch to track exercise and she’s lost 8 pounds so far. That’s a LOT! (3.6 kg for you metric people.) Now here’s a really interesting bonus prize. She told me that since she’s tracking calories, she’s not going out to eat as much, and she’s found extra money at the end of every week! How’s that for a double bonus prize? I credit AppleWatch too, and LoseIt. I must complete my circles. That “must complete my circles” thing is funny in how compelling it is. I remember the same feeling with Fitbit and those darn steps. If my goal was 10K steps and I was at 9950 before i went to bed, you’d find me wandering around my house at night trying to get those last 50 steps! I have a testimonial of my own. 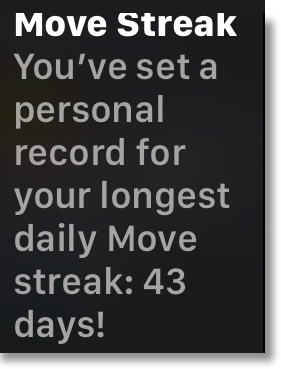 When Bart talked about his move streak of a hundred days on the Apple Watch, I said that I rarely get 7 in a row. I exercise for 45 minutes in the morning and walk the dog for about an hour or so in the afternoon. I would have told you, before this conversation with Bart, that I hit my 600 active move calorie goal usually 5-7 times a week. Don McAllister told me about an app called Activity++ for iOS that shows a pretty nice display of your Apple Watch activity. I opened Activity++ after talking to Bart about move streaks and found a statistics section. In there it said that I had reached my goal only 40% of the time! That would mean that only three days of the week I was hitting my goal! See how delusional we are? Just like we think we can diet without counting calories/carbs/points and be successful, even as much as I exercise and babble about it to others, I also was delusional. After I discovered that, I started really doubling down on keeping a streak going. I hit 7 days and got my little happy badge from the Activity app. Then I made 2 weeks and kept going. Lindsay went into labor and I lost hours of valuable exercise time driving to San Diego, but while she was in labor I lapped those hospital grounds over and over again and kept my streak going. When went back to San Diego to spend a week with her and the baby it got really hard to keep the streak going. I was away from the gym and my lovely beach for walks. In the relatively cool mornings she really needed us to watch the baby while she got some sleep so I could only walk in the 85 degree heat (that’s 29C for you metric people). But walk I did. I couldn’t let that streak die! The hardest day was when I’d come back from walking to the store at around 5pm (I’d walked earlier in the day too) and Lindsay, Nolan and Steve were all on the couch happily relaxing with beer. They tempted me … but I turned right around and walked 2 more miles as hard as I could to get those last 200 calories burned and my circle complete. I had that beer when I got back! 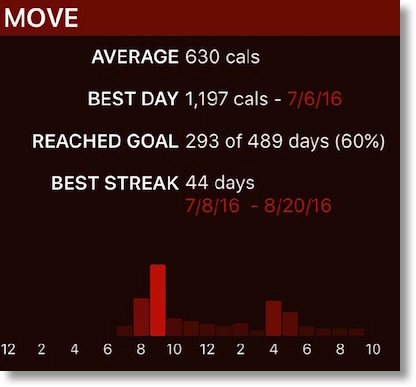 I’m now at 43 straight days on completing my move calorie goal, minutes of exercise and even that pesky stand goal! Activity++ now says that I’ve met my goal 60% of the time it’s been tracking me. I’m making progress! The moral of the story is that we all need inspiration and I’ve benefited from listening to Bastian and Bart and all of you. Now I have to get away from this keyboard and go for a walk! Thanks Allison for the shoutout 🙂 Bart & You inspired me so much, that I even published my own blog post on the tools you discussed. To help you get a feeling for how “successful” you were in inspiring me, here a statistic that you’ll find hard to believe, but it is true: I lost 6.2kg – that’s 13.6 lbs for you Imperial Measures folk, since listening to your CCATP episode and just giving the tool a good try. Tracking food has really been the key for me. Doing that, and monitoring my *active* calories lets me know if I can have pizza or need to stick with salad. If my red circle isn’t looking so great, I pop over to the gym at the office for a quick run before heading home. I also love watching my resting heart rate improve with HeartWatch. All this data is fun to track and motivating. I especially like that I can follow the rings and watch my eating and I will see progress. Zero guesswork. The drive to ‘complete the rings’ made me do something interesting last week. I took a week off work and my wife and I headed out of town for a while. We left on Tuesday on a 440km (273mi) drive which we were going to take at a leisurely pace, and planned to make the return trip on the Friday. So I knew two days out of the week were going to be hard going meeting my usual 2,500kj (a shade under 600 calories) active ring and I had no idea about the two days away. So when I got my Monday summary, I halved my goal. Monday was a bit of a gimme at home. Simply packing for the trip met most of my goal! On the two driving days, we did wander about during breaks in the driving and I managed to get about 1.5x the goal, so 0.75x my normal goal. The two days away I got a new badge both days – TRIPLE GOAL! So I had effectively achieved 1.5x my normal goal. Understandable when I noted both days we had walked 17km each day. By setting the reduced goal, I was able to take the well earned break, but still set myself a minimum activity level, and, importantly, get the satisfaction of closing those rings every day. I even managed the 30 minutes exercise on the two driving days AND the 12 hour stand goal!